BBC Weather warned that the brutally cold conditions are not over yet as bitterly cold gales from northern Europe look set to strike the UK on Saturday. 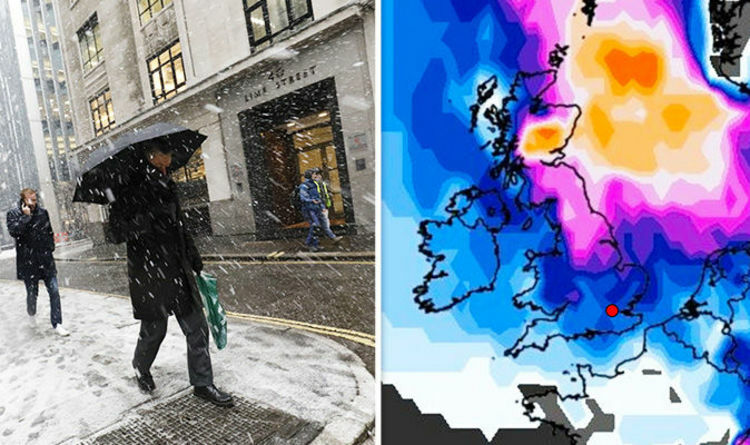 A shock weather map from WXCHARTS shows the UK covered in snow on Sunday only weeks after the deadly Beast from the East caused chaos throughout the country. According to the snow chart, the worst hit area will be the central belt of Scotland and parts of northern England. BBC Weather Meteorologist Matt Taylor warned the bizarre weather is set to take another turn as temperatures could plummet again following what has been called the warmest weekend of the year so far. Mr Taylor said: “Before you get too complacent about temperatures on the up, we could see colder weather from the north of Europe return on easterly winds towards the weekend. Meteorologist Liam Dutton warned Britons could be set to see “another burst of Siberian air” sweep across the nation. He tweeted: “Beast from the east, part two? “Another burst of Siberian air may push westwards over Europe next weekend. It’s unlikely to be as intense or as prolonged as the last cold spell. In the meantime, the Met Office said there will be heavy rainfall for much of the south of England on Monday. Met Office forecaster Alex Deakin said it will be “dull, wet and in places quite a blustery wind and feeling quite cool with the cloud and the rain”. Mr Deakin said: “By the afternoon there will be some heavy showers developing, especially across south-eastern areas. “Most areas will be cloudy on Monday but there will still be some dry and brighter weather reserved for north-western parts of Scotland, but for most areas brightness will really very limited indeed. Heavy showers could break out on Monday evening before drier and clearer weather takes over during the course of the night.